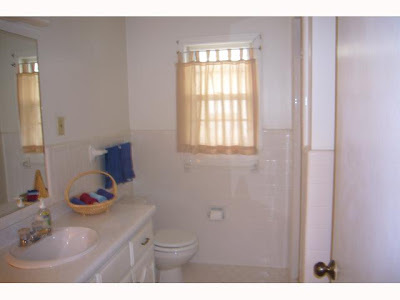 A MLS photo of the bathroom as we saw it during the house hunt. As I've said in the past on this blog, one of the reasons we loved our house and decided to buy it was because of the bathrooms. They are large for a house of this age and have a lot of storage. They are in great shape and don't need too much updating. Like the rest of the house, the walls were white when we bought the house. In addition, like the front bathroom, this back bathroom (which is located on a hallway across from our den and in between our middle and back bedroom) has the "vintage" white with gold speckle counters and ugly brass cabinet handles. In addition, the light fixture was dated. Tyson enjoys sitting in the sinks of our bathrooms. Here you can see the counters. With a little paint, a new light fixture (the same as the front bathroom, the $29 contractor special from Home Depot), and a new window treatment, we're on our way to having a cute bathroom. We don't have the money yet to put new counters and cabinet pulls in this room since we're prioritizing other places so this was a cost-efficient fix to the bathroom to make it "ours". I am so impressed with all of your renovations so far! It took Scott and I alot longer to do everything at our house :) Happy New Year!